Madelyn Kearns for Seafood Source: Farmed salmon and trout producer Cermaq is planning to introduce the “most innovative and efficient processing facility for salmon ever created" in 2018, the company announced on 11 July. The “smart” facility, located in Storskjæret, Norway, has been under construction since March 2017, with the first fish set to leave the 8,000-square meter, state-of-the-art site by the end of the second quarter in 2018. 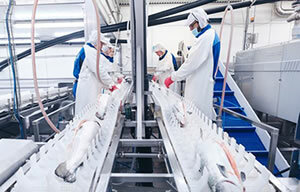 Baader GmbH and Oslo, Norway-based technology developer CodeIT AS have been asked to create and implement a new centralized production line for the facility, with the latter set to supply a cross-platform, inter-connectivity and digitalization interface that has earned the site an Industry 4.0 manufacturing facility title – one of the first of its kind for seafood. “We as an industry are being more and more challenged on documentation and traceability, our green footprint is important to all our future planning and this is why we have chosen CodeIT AS to deliver a solution that fits our requirements very well. They specialize in intelligent and flexible software that gives us the control and visibility we need,” Cermaq Project Leader Atle Kvist said.